Chilli from the group TLC is going to be hanging out on Twitter with SheKnows on Friday, Jan. 24, at 10 a.m. EST. Find out how to tweet your questions to her. Tweet us your best questions by using #SheKnowsChilli. Then join us live on Jan. 24 at 10 a.m. EST to hear the answers to all your questions during our Twitter takeover with TLC’s Chilli. Rozonda “Chilli” Thomas has had an incredible career as one-third of the girl group TLC. They hit it big in 1992 with their first album Ooooooohhh…On the TLC Tip. That album spawned big hits like “Ain’t 2 Proud 2 Beg” and “Baby-baby-baby.” Ever since then, the superstar has been a strong force in the music industry. That’s why we’re handing over our Twitter account to Chilli on Friday, Jan. 24, at 10 a.m. EST. Chilli is now in her third decade with TLC, and the group is back in a big way. With Lil Mama covering the late Lisa “Left Eye” Lopes’ part, they performed at the 2013 American Music Awards and released a compilation album called 20 last fall. In addition, VH1 premiered a biographical film about their career called CrazySexyCool: The TLC Story. Chilli is focused on a worthy cause, too. 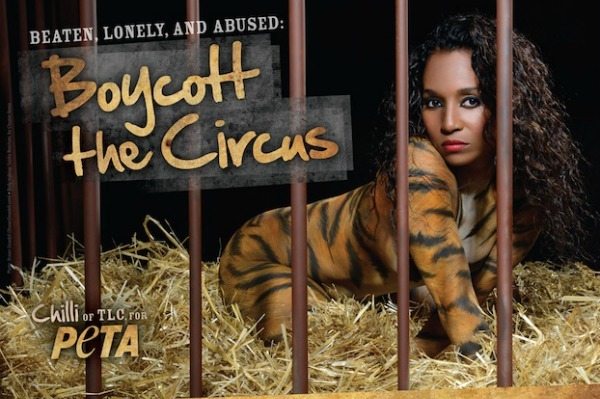 She recently posed for PETA in their new anti-circus campaign, “Boycott the Circus,” which talks about tigers being beaten and mistreated when they aren’t performing in shows. Get your questions ready for Chilli because she’ll be here to take over our Twitter account. Do you want to hear what’s next for TLC? Wondering if TLC will be touring soon? You can find out about all of that, or you can even ask Chilli about her work with PETA and about their new campaign. You never know what will happen when Chilli takes over our Twitter account, so get your questions ready and join us live on Jan. 24 at 10 a.m. EST. Follow @SheKnows_Ent for updates on Chilli’s Twitter takeover on Jan. 24 at 10 a.m. EST.